Don’t you just wish sometimes that the water you drink straight from the tap has been irradiated with nuclear waste so that you can grow an additional limb to help out with the house chores? The Third Hand Adjustable Parts Holder saves you all that biological headache. The Third Hand Adjustable Parts Holder might not be quite as incredible as having an actual third hand, but it’s still very useful and always ready to assist. 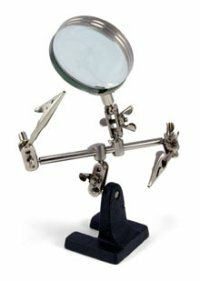 Two adjustable arms with alligator clip jaws hold parts in place and the magnifying lens is perfect for getting a detailed view of your work area. Great for holding circuitboards when performing soldering or doing precision repairs or assembly. The Third Hard will retail for $6.99 a pop. These have been around since like the eighties… at least. thanks for the prize a while back by the way, I bought some sweet headphones. Sold these in the late 70s and 80 at Radio Shack. Couldn’t live without it.